Cyclists ride on the designated Bloor Street bike lanes in Toronto, on Oct. 12, 2017. A coalition of activist groups is trying to push road safety high up the election agenda, saying Toronto is at “a crisis point” and not doing enough to protect pedestrians and cyclists. Bringing safety and city-building groups under one banner, the team issued a 15-point plan on Tuesday for bringing down the death toll, vowing to canvass candidates on it and release their answers before the municipal election this fall. “For too long, our streets in Toronto have been measured using one priority: the movement of cars,” said Amanda O’Rourke, executive director of the group 8 80 Cities, which works to make urban areas safe for young and old. Toronto introduced its road safety plan two years ago, with the goal of reducing deaths and serious injuries by 20 per cent over a decade. 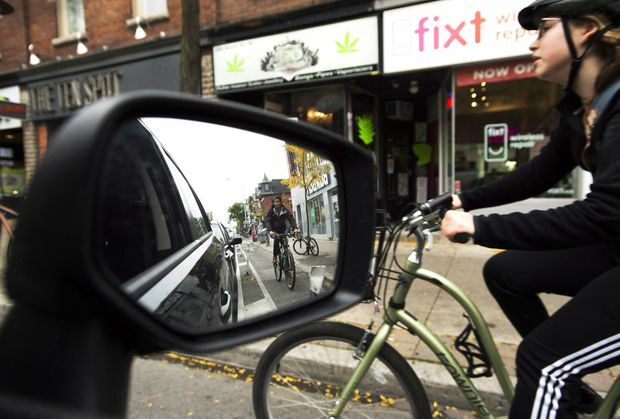 That modest ambition prompted howls of outrage, and the plan has been beefed up repeatedly; it now aims to eliminate deaths and serious injuries through a combination of changes to driving rules, additional bicycle infrastructure and road redesign. The year 2016 was the deadliest in more than a decade for pedestrians and 2018 is on pace to be another bad year. There does not appear to be any sustained improvement, making it unclear what impact the plan is having. The 15-point plan introduced on Tuesday includes ideas that have been implemented successfully in other cities. But some of these, such as banning vehicular right turns at red lights and reducing speed limits, may struggle to find political support in Toronto, where a number of councillors regularly resist measures that risk worsening the flow of traffic. The result has been site-specific changes that are criticized for being too narrow in scope. Mayor John Tory offered a qualified endorsement of the list of proposals when asked about banning right turns at red lights, which the city has done in some places. On Tuesday Mr. Tory won the support of his executive committee for a boost of as much as $13-million for the road safety plan this year, which would take its five-year budget to $100-million. The extra money still has to be approved by city council next week. However, activists have criticized Toronto’s approach for falling short of the sort of concerted action being taken in other cities, including New York. In 2013, New York introduced a road safety plan with a heavy focus on police enforcement, the redesign of roads and the introduction of protected cycling infrastructure. Over four years, overall annual traffic fatalities dropped 28 per cent and pedestrian deaths were down 45 per cent. Toronto’s early efforts have focused on superficial changes. But transportation staff say more substantive work is coming. And Councillor Jaye Robinson, who chairs the Public Works Committee, says New York’s funding includes expenditures on bike lanes and road maintenance that Toronto accounts for outside its more narrowly defined road-safety budget, making it unfair to compare them.